While holidays are fun, they are often a busy time of year when you’re prompted to spend a lot of extra money. With Halloween right around the corner, you may find yourself spending extra money on costumes, decorations, parties, festivals, etc. On the flip side, you can also use this holiday to get creative and make some extra money instead. 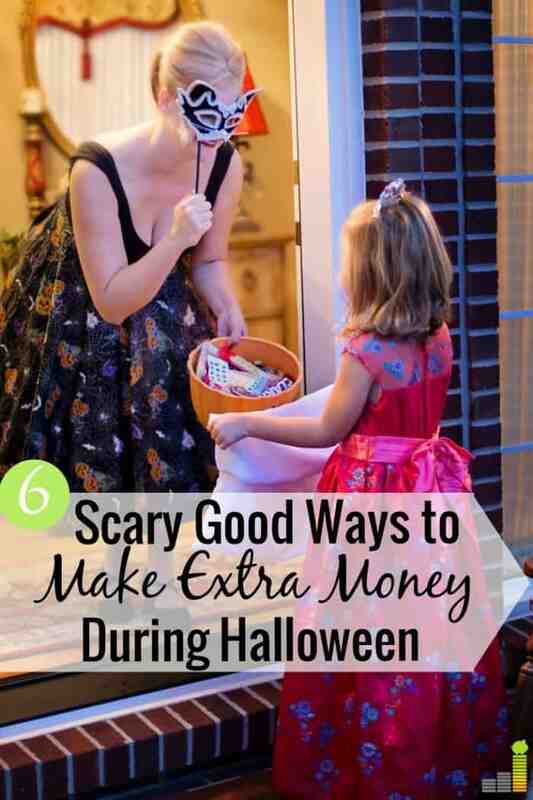 Here are six easy ways to make money during Halloween week. One of the easiest ways to make money around Halloween is to sell old costumes you have around your house – especially if you have kids. My son loves dressing up each year and I love looking at everyone’s costume when we go trick-or-treating, but it bums me out that most costumes are only worn once or twice depending on how many events you attend. No one wants to wear the same thing two years in a row and while you could donate some of your old costumes, you could also sell them around this time of year too. If you have adult costumes, you can make a good profit even if you offer a discounted price since brand new costumes tend to cost anywhere from $50 – $100+. You can sell your costumes online on sites like Amazon, eBay, Craigslist or even offline at any local buy-back resale shops. Considering selling up until the week of Halloween because there will probably be plenty of procrastinators looking for last minute costume options. If you’re not crazy about Halloween or have no desire to do anything outside of the house that day, consider babysitting or pet sitting for friends or neighbors. It’s an easy way to make extra money before Christmas. Some parents may have kids who are too young to go out and trick-or-treat and may want to take the older ones out instead. Or, others may be working and need someone to chaperone while their kids are out trick-or-treating. Plus, some adults like to enjoy the festivities just as much as kids. In that case, you may be able to babysit or pet sit while parents go out for Halloween parties and events over the weekend. Aside from cutting the cable cord, pet sitting is one of the easiest ways to put more money back in your pocket; that’s money you can use to boost your savings, pay down debt or any number of personal finance goals. If you’re going to be sitting at home passing candy out, tape a business card to candy if you’re looking for more work for your side hustle or business. You can even create a small flyer mentioning an offer or discount you’d like to provide. Whether you write online, give music lessons, walk dogs or clean houses, you never know who will be interested in your services. Parents usually tend to sort through all the candy at the end of the night and will see your card. If you end up passing candy out to at least 100 people, it will be an easy way to get free leads that could convert into customers or clients. There are a ton of parties and events leading up to Halloween and even the week of. If you have the availability and can provide certain services like make-up, face paint and demonstrations, you may be able to work for a few hours at different parties. Start by making a list of all the upcoming Halloween parties in your area, then reach out and see if they need help for the day. You can do simple things like be a door greeter, clean up, pass out candy, etc. In my area, they host a huge Halloween party at one of the universities and a lot of families attend. If you sell products or provide a unique service, you may even want to ask if you can set up a vendor booth and earn money that way. Once you earn that extra money, it’s wise to have a plan for what you are going to do with it. If you don’t have a specific bill you’re paying off, open a savings account with an online bank like Barclays Savings, that has no minimum balance and pays decent interest on the money in your account. Or, invest your money and make it grow. It’s possible to start investing with $100 or less and make progress toward your financial goals. Like the idea of getting paid to scare people? You could actually get hired to work at a haunted house or haunted corn maze this year to make extra money. Judging by the job listings on Indeed, you won’t really need any special experience or skills to do this aside from the ability to pop up on people in very creepy makeup which actually sounds pretty fun. Six Flags hires haunted house actors for their huge attraction each year as long as you’re at least 16 years old. Depending on where you live, Halloween might be a pretty chilly day. One year, it even rained pretty bad where I live in the Midwest, which is why it could be a good idea to set up a coffee or hot cocoa stand to sell to parents who are trick-or-treating with their kids. If you’re going to be warm in your home handing out candy, some trick-or-treaters may appreciate you offering them a warm beverage for a small cost like $1 – 2 per cup. This could add up to a nice chunk of money at the end of the night if you’re on a busy street or high-traffic area. Whether you enjoy Halloween or not, it’s a mega holiday that produces billions of dollars for retailers and other companies. It would be wise to take advantage of the season and earn some extra money for yourself as well. Have you ever tried earning extra money on Halloween? What are some other holiday related side hustles you’ve tried in the past? What unique side hustles have you done to make extra money? The post 6 Spooky Ways to Make Money During Halloween Week appeared first on Frugal Rules.